A record number of unaccompanied children have been apprehended along the U.S.-Mexico border since October, an influx so large that President Obama has called it an “urgent humanitarian situation.” To help house the overflow of children, emergency shelters have opened at military bases in California, Texas and Oklahoma, in addition to a facility in Arizona. And the U.S. Department of Justice on Friday unveiled a new $2 million legal aid program to help children navigate immigration courts. Between Oct. 1, 2013, and May 31 of this year, 47,017 unaccompanied children under 18 traveling without a parent or guardian were taken into custody, according to U.S. Customs and Border Protection. That total is nearly twice as high as all of the last fiscal year (24,493 apprehensions), with four months yet to go in the current fiscal year. One unofficial government estimate projects apprehensions rising to 90,000 in 2014—nearly four times as many as the year before. While Mexico is the top source of unauthorized immigrants in the U.S., three of every four unaccompanied children apprehended this year have come from Central America. Honduras, a nation wracked by gang violence, has seen the most striking increases. This year, more than 13,000 unaccompanied Honduran children were apprehended at the U.S. border compared with the 968 children apprehended five years ago. 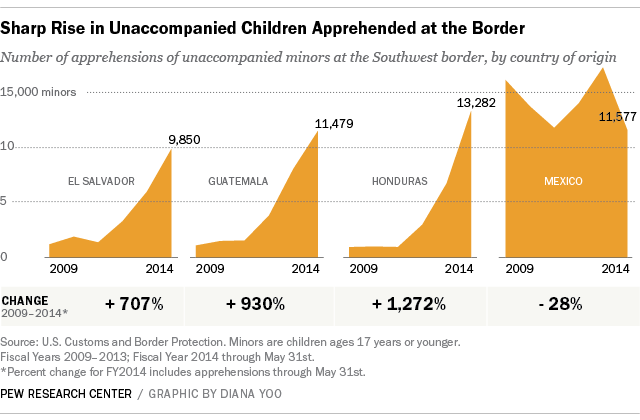 The number of unaccompanied Honduran children apprehended in 2014 so far is already nearly twice as high as all of last year. 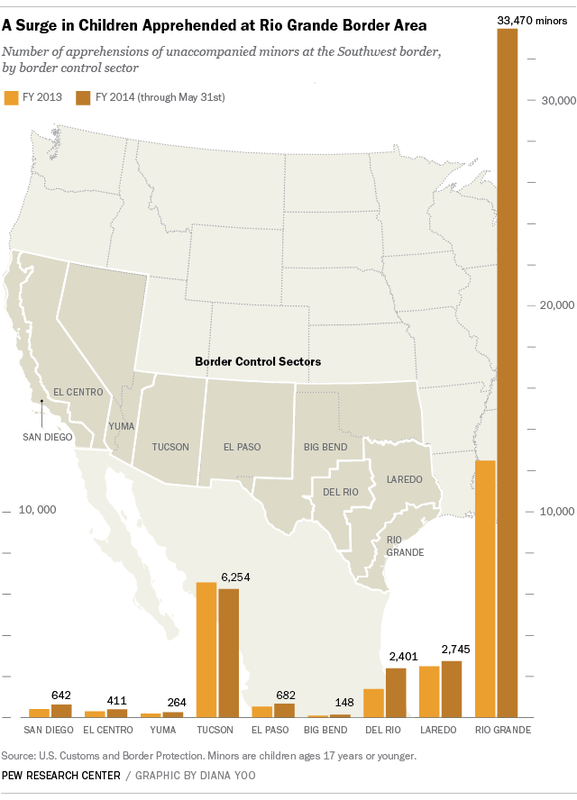 The spike in apprehensions has come largely in the U.S. Customs and Border Protection’s Rio Grande sector, which is located along the southernmost tip of Texas, and bounded by Mexico and the Gulf of Mexico. Some 71% (or 33,470) of all apprehensions of unaccompanied minors this year have taken place here. Compared with 2013, apprehensions eight months into this year in the Rio Grande sector are up 168%. By comparison, the sector with the next highest number, the Tucson sector in Arizona, which runs 262 miles along the U.S. border with Mexico, has 6,254 apprehensions so far this year, nearly equal to the total from all of 2013 (6,569). Obama administration officials have said the increase in unaccompanied youth at the border could be due to violence and poor economies in children’s home countries, such as in Honduras and El Salvador, and the spread of rumors that children who arrive at the border without parents won’t be deported. Meanwhile, Republicans blame a 2012 policy that has resulted in two-year work permits and deportation relief being given to more than 600,000 unauthorized immigrants who came to the U.S. as children. With the first round of permit renewals coming up, Republicans blame that policy for stoking rumors that the U.S. won’t deport children. Children caught at the border are placed in deportation proceedings, and turned over to a family member in the U.S. who can care for them while their case moves through immigration court. If family can’t be located, the children are placed in the care of the U.S. Department of Health and Human Services. Mexican children are more likely than those from Central America to be deported quickly and reunited with family in their home country, in part because of agreements between the United States and Mexico governments. While figures on the age and gender of unaccompanied minors from Central Americans countries were not available, 98% of the minors from Mexico who were apprehended last year by U.S. authorities and returned to Mexican authorities were ages 12 to 17, and 89% were males, according to the Mexican government.